“How can you eat something that looks back at you?” I get that question a lot whenever I pack bento that have eyes. Maybe I’m heartless. Maybe they don’t look like animated objects to me. Or maybe I’m just darned hungry. Truly, it’s never bothered me, even as I squeal, “kawaii desu!” over a bento. So bring on the cute critters and I’ll bring on the appetite. I wanted something light and quick to prepare that’s why this bento has mostly instant food. The onigiri was made from pre-cooked rice that was frozen, then microwaved without defrosting. I simply dusted my hands (still slightly wet) with salt, then hand molded away. Since I was making just one onigiri, I opted to hand mold so there won’t be any leftover rice. To go with my plain onigiri, I fried some chicken fingers and boiled some octodogs. I shaped my octodogs with an octopus weiner cutter but they can also be made with a sharp knife by cutting slits on one end of the hotdog. Normally, I prefer frying hotdogs but since I wanted them to retain a nice octodog shape, I opted to boil instead. I think I overboiled though, that’s why their tops kinda puffed out. In the corner, I have some shredded iceberg lettuce which I planned to dress with a bit of blue cheese dressing. To add a happy, festive touch to the bento, I cut some faces from a sheet of nori. For the onigiri’s happy face, I used a pair of sharp scissors. For the tinier eyes, I used an experimental technique that occurred to me as I was digging through my cookie cutters. What technique? Simple! I used a drinking straw! Creating tiny two-toned eyes for your bento creatures can be easy. 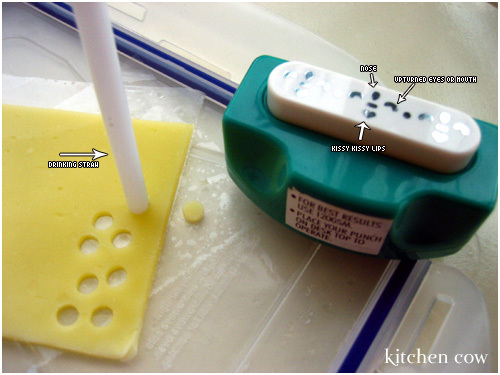 Lay a slice of cheese on a flat surface, then, with a drinking straw, cut circles from it. Tap out the cheese circle from the straw, then embellish with a nori cut-out pupil. You can either use a sharp pair of scissors, or a craft punch. You don’t have to have a specific eye-shaped craft punch. You can improvise by using parts of more intricate designs. For handling the small pieces, it’s great if you can set aside a special pair of tweezers for handling food, like tiny nori cut-outs. Since I don’t have to cut out irregular circles using a sharp knife anymore, you can bet that I’ll have fun with these tiny eyes on my bento more often. So, how do I eat bentos with eyes looking at me? Simple. Very gleefully! Looking for Hotdog / Sausage / Weiner Cutters? Visit Jbox and check out their selection of weiner cutters! This entry was posted in bento, take a tip. Bookmark the permalink. how resourceful. hehe! this entry reminds me of calvin and hobbes. you know how they would build snowmen/snowcities and they would stomp on it after like they were godzilla/dinosaur. i think it’s similar to what you’re doing. hehe! 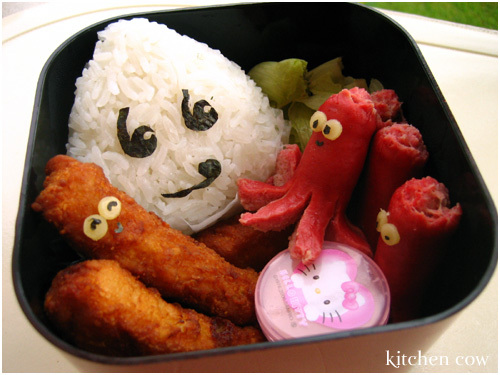 this has got to be the cutest bento you have ever done. galing!!!! i dont think i could bring myself to eat the onigiri and hotdog… i can’t say the same with the chix fingers though…. MWAHAHAHAHAHAHA!!!!!!!!!!!!!!!!!!!! As I’ve already mentioned, this is a super-kawaii bento! And I just wanted to thank you for the tip on that specific cutter! I’ve gor various cutters but it’s always GREAT to get a second look on what you’ve at first discarded a s “useless” – only to suddenly realise that this is the one cutter you can’t live without! Thanks!!! Now I am really really interested with your bento. Heto na nga iniisa isa ko na… I can see you prepare healthy food and the presentation is pretty amazing. So cute!!! Haha. Do you cook your octodogs before slicing them, or is it the other way around? Next time, you’ll be making some edible clothes and accessories for Aki. Heehee, thank you muchies! Honestly, I’ve had the cutter for so long but haven’t used it since I found the tulip cutter useless. It turns out that the octodog cutter isn’t as bad. I do wish it were made of something sharper, like steel though so I didn’t have to smush the hotdog too much. Or maybe we just have softer hotdogs? Not always healthy. ^_^;; *Hides fried fatty pork bentos* Still, it’s something I’d recommend to anyone since it really does brighten up an otherwise dreary day. I don’t know WHAT you’re thinking but knowing you—please don’t go there, I beg you. I’m trying to keep this site safe for all ages, you know. You are the bento master!!!!!!!!!!! I love the faces. My mom keep telling me the same thing saying, “That is too cute to eat!” but, like you, I disagree. Hi! How do you stick the eyes onto the hotdogs? Love your site! Will use it as reference as I try to prepare bento for my kids baon. They’re so slow in eating, hopefully this will make them enjoy their lunch and make them eat it faster! There are fake cheeses, but they usually put a little milk into it to make it stretch and melt, and, well, behave like cheese. This is fine if you just are lactose intolerant, but not great if you have an actual milk allergy. Thanks for the other ideas! They’re usually stick because of the moisture from the cheese and from the hotdogs but if you want something that’s more steadfast, I know some bento makers use either mayonnaise or ketchup.